The beginning of St. Stephen can be traced back to a handful of settlers from Cologne, Germany, who cleared land some 90 miles north of Chicago and 5 miles west of Lake Michigan in the early 1840s. They called their new community New Coeln (or new Cologne) and situated among their homes was a privately owned small log cabin used for celebrating Mass once a month. Feeling ready to build their own church, every landowner contributed logs toward construction and their first church was completed in the fall of 1847. St. Stephen, the first martyr, was chosen as the patron saint of the parish. In 1850 a school and rectory were added, but in 1884 with a parishioner vote of 60-15, it was decided a new church would be built using the French Gothic design. Tragedy struck this new building on May 13, 1908 when a fire broke out and gutted the church, with only its walls remaining. Salvaging what they could, the parishioners set out once again to rebuild and as they did so, made beautifications such as new art glass windows and decorations for the altar along the way. This building was short lived as a second fire struck on January 1, 1926, destroying both the church and rectory. Although some thought the parish should disband, others displayed the courage of those first settlers and in 1927, 85 families began the rebuild yet again. 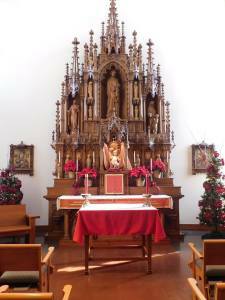 This church contained some very special features such as the altar and sanctuary carved out of Slovanian white oak and a hand carved communion railing, lectern, and sedilia created from imported black walnut. These carvings were the first to be seen anywhere and some remain with us today in our church and chapel. St. Stephen’s Golden Jubilee was celebrated in 1897 and in looking forward to its Centennial Celebration in 1947, new floors, partial relief oak carvings of the Stations of the Cross and a shrine of Saint Joseph were added. Around this same time period as Milwaukee extended its boundaries to College Avenue, the Town of Lake and New Coeln were absorbed and St. Stephen became a metropolitan congregation. 1973 brought a celebration of 125 years for the parish, but tragedy struck a third time on Palm Sunday, April 8, 1979 when an arsonist broke into the rectory and set fire to the basement stairway. While extensive smoke damage was suffered, the rectory and the church were saved from total destruction. The ensuing years brought increased airport expansion, area churches combining memberships, closing of the parish school in 1992, and a directive from the Archbishop that St. Stephen had one of three choices to make: to close, to join another parish, or to build in Oak Creek. With the latter being the final decision, in October of 2008, the parish officially broke ground. 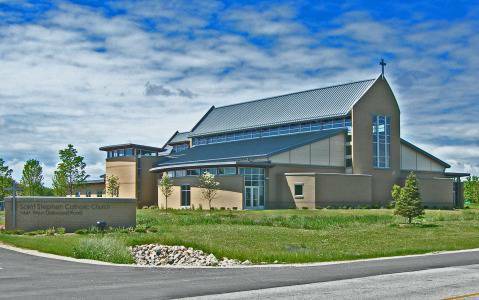 Despite yet another natural disaster of a lightning strike hitting the bell tower just one month prior to opening, the brand new St. Stephen Church was formally dedicated by Bishop Richard Sklba on November 22, 2009. Despite numerous setbacks and adversities, the parishioners of St. Stephen’s have always joined together to overcome challenges. The current building is a wonderful mixture of old and new, serving as a reminder that all the generations that have been a part of St. Stephen contain a spirit and pride that cannot be stopped. Please continue to browse through our website and come back often as it is updated on a regular basis. THANK YOU FOR VISITING OUR WEBSITE.